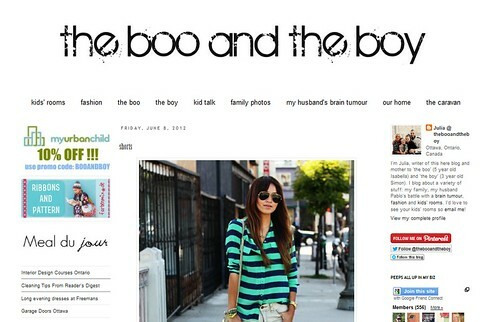 The Boo and the Boy is one of those blogs that I've been reading for soooo long that I kind of feel like I know Julia. She is so honest about her life, which is always so endearing and inspiring. She writes candidly about her husband's health concerns, and it's amazing to see how her family sticks together through everything. It's also SO incredible to see just how strong she is. I admire her a lot. If you're ever in need of inspiration, be it in fashion, design, or life in general, I highly suggest you start reading this blog. And work your way backwards....it's pretty awesome. Julia was kind enough to participate in Five Questions, here's what she had to say. What do you like most about writing your The Boo and the Boy? What I like most about writing my blog is meeting all sorts of wonderful people from all over the world and all the love and support that my family and I have received over the last few years. When I started my blog, I wrote about my kids and their milestones and I blogged about kids' rooms (since I love interior design). My husband was diagnosed two years ago with a brain tumour and I started blogging about it and it was a great way for me to share my frustrations with what we were dealing with and to keep track of what was going on medically. I love that my blog is a daily journal, a bit of everything that I'll have forever and that I can share with my two small children once they are older. In the next few years, I'm hoping that my blog will be less about my husband's medical issues. It's been two years straight of medical appointments and surgeries for my husband and we're hoping for all that to slow down soon. I've recently started blogging about fashion on Friday's and that stemmed from my two sisters starting a fashion blog Closet Rivalry and my interest in fashion grew from there. My blog grows as my interests grow. My blog is my hobby and it'll morph at the spur of the moment as I come up with other ideas for it. Me time is rare and you'll see why in the next question. My blogging time is really the me time that I get and that is usually after the kids are asleep and before I pass out of exhaustion for the night. The last two years of my life have been crazy and insane (since my husband got sick) so there just hasn't been a whole lot of time for just me. I don't mind though because my kids are happy and my husband is still with us and doing well. On a typical weekday, I wake up at 4:45 am. I arrive at my full-time day job with the government around 6:30 am. I work like a dog till 3:00 pm when it's time to catch the bus home. I get home at 4:00 pm and spend a few minutes with my two kids and husband and find out how their day went. I then cook dinner and once that is over, the kids are bathed and we all hang out until it's time for the kids to go to bed - usually around 8:30 pm. I break out the laptop in bed to blog and watch tv then I usually fall asleep by 9:30pm. This is a typical Monday to Friday for me. The beginning is hard - trying to develop an audience - but you have to stick with it and not give up. Be yourself and do what you love, what comes from your heart. That is what a good blog is made of. Thanks again to Julia for taking the time to do this!! And to everyone else for reading! 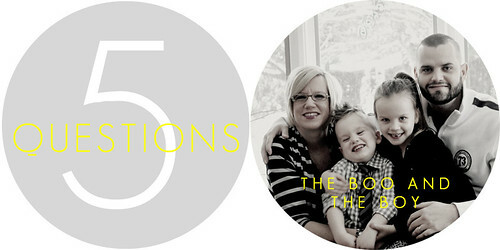 You can read last week's Five Questions post here. And more to come next Wednesday...I've had more very cool blogger's respond and I can't wait to share their answers with you! Wow, what a hard working woman!